MYO Coaching Program Results In Work Experience Placement. Isle of Man teenager Jasmine Potts has long dreamed of becoming an automotive engineer. Now, with the help of MYO and thanks to a local business, her dream is one step closer. LC Motors – who are based on the West Quay at Ramsay – were so impressed by Jasmine’s enthusiasm and knowledge that they have offered her a 12-week work experience placement. The Manx Youth Opportunities team who coached and mentored Jasmine included Angelena Boden of training company ‘The 15 Minute Trainer’ (link = http:/ www.thefifteenminutetrainer.com), and Nigel Watson of helicopter management company Luviair (link = http://www.luviair.com). 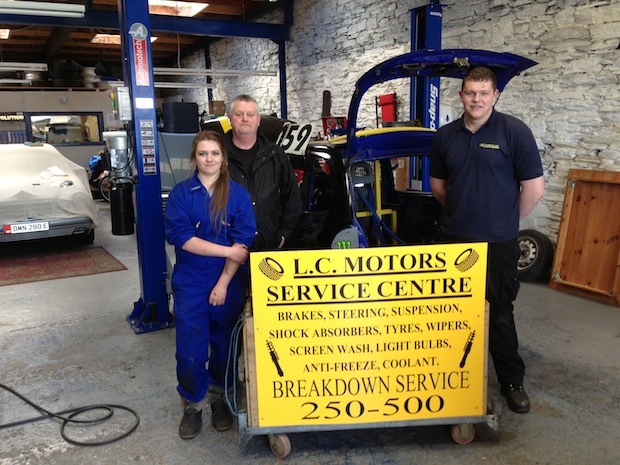 In the photograph above, Jasmin is shown with Dave Oldland and his son Will at LC Motors service bay. All of us at Manx Youth Opportunities wish Jasmine the best of luck with her work placement and hope it’s the first step in a successful career.